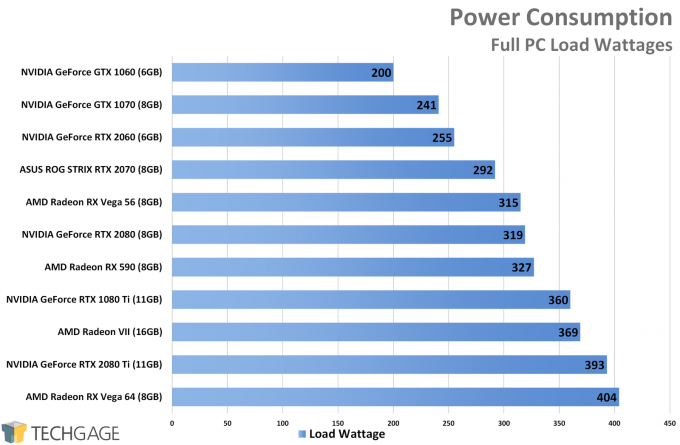 To test for power consumption, a Kill-A-Watt that the PC itself is plugged into is used for monitoring a Far Cry 5 4K benchmark run. Admittedly, we don’t have the best methods for power testing, and would love to improve them in the future, but for now, we use what we have, and that’s our eyeballs. Over the course of the one-minute benchmark, a rough average is pulled. 7nm can of course mean less power draw, and in Radeon VII’s case, it manages to draw ~50W less than the Vega 64, while easily outperforming it at the same time. Of course, RX Vega’s high power draw can be remedied with Wattman, but sadly, most people won’t know to use it, so it’s nice to see VII’s power draw to be a lot more modest out-of-the-gate. It could possibly be improved further if you want to spend time in Wattman, but up to this point, time hasn’t allowed us to dig into that. On the pro side, the VII is easier to draw up some conclusions for. It helps that this is the fastest GPU AMD has ever made, so if there’s a scenario that will take advantage of OpenCL, this card should perform great, based on our experiences with such tests as Blender and LuxMark. 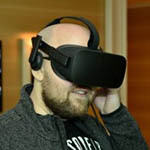 Oddly, the OpenCL Radeon ProRender continues to give NVIDIA the performance lead, defying logic – but there could be many things attributed to it. When time allows, it’ll be worth exploring ProRender in other design suites to see if the performance outlook is any different, but at the same time, ProRender also gave us slower-than-expected performance on the CPU side as well, especially with the 32-core Ryzen Threadripper. Either way, once it makes sense to test further, we’ll jump on it. Not all of the performance seen throughout the article was that impressive, with Radeon falling behind in MAGIX’s Vegas, but that could possibly point to software updates being needed. With Adobe’s Premiere Pro performing just fine with the VII, there’s definitely room for some improvement with Vegas. 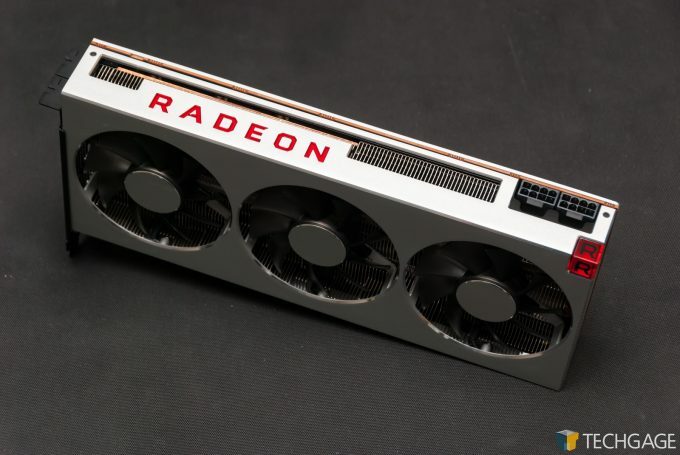 SiSoftware’s Sandra helped us establish that the Radeon VII is one hell of a compute machine, outperforming all of the other chips in the scientific test – even without the use of FP64. But on the topic of FP64, if you have workloads that require it, then the VII is going to outperform any other gaming GPU you’ll bring home. We may dig into this deeper at some point, but the scenarios typically used for double-precision are a bit outside of our wheelhouse. While gaming wasn’t tackled here, it was in this complementary article. In it, we see that the VII keeps up to the RTX 2080 fairly easily overall, with two games in particular catering much more to NVIDIA than AMD. We also experienced some odd driver issues during our tests, but AMD has assured us that the first post-launch driver will patch things up nice. And with that, you hopefully have a better idea of whether VII is suitable for you in compute workloads, but if not, leave a comment with what software you’re using, and we’ll try to help. 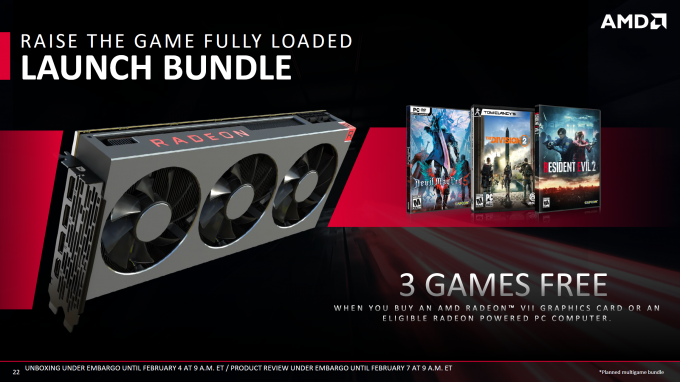 It might not be ideal in all situations, but AMD’s Radeon VII is a very well-rounded graphics card. It delivers great performance in gaming, potentially excellent performance in math-heavy workloads, and shines with strong OpenCL performance in applications like Blender and LuxMark. With 16GB of memory on tap, the card’s $699 price tag seems more than fair. For those looking for a pure gaming card, the RTX 2080 may be the better choice. You’ll lose 8GB off of the memory by going with RTX 2080, but you’d gain things like Microsoft DXR and NVIDIA DLSS support, as well as smaller features like the screenshot tool Ansel. If you believe 8GB will not be enough for your gaming workloads over the next few years, then the allure of VII will only grow stronger. As always, it pays to know what you’re looking for in your graphics card. If luck is on your side, the VII will complement your workloads just fine. The results scattered throughout this article can help you decide which way you should be swaying. Games might not cater to those who want this card for compute workloads, but if you happen to be a gamer as well as a creative genius, you may be interested to know that a VII purchase will qualify you to receive three AAA titles that recently released, or will release soon. The three games are a $180 value, so even if you can’t use them, you may have family or friends who can. Ultimately, this bundle helps improve the value proposition here, and does it well.